Wow...this month is over!! Where in the heck did it go? As I get older - the days go by faster and I simply have too much to do for this nonsense - don't you agree? This weekend was a busy one.. I had two sessions of B-a-a-a-d Girls Club! What fun! We all worked on SHEEP name tags!! They turned out adorable! What fun 'show-n-tell' projects we had too! Such talent in that room... I'm here to tell you. Today is a catch up day for me... putting away all of my weekend supplies - getting my head wrapped around next month's project - finish cutting out a quilt - work on printing my fabric (Inklingo) for my hand piecing project(clam shell pickle dish) - stitching on my wool blocks ..... Whew... time for a nap! Hey... I found some cool things to show you over the weekend!! Ok.... this is the jackpot for me! 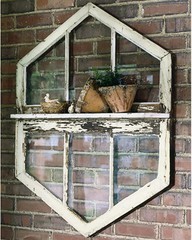 LOVE old windows... and this one is so unique - it's gorgeous. Then they attached an old shelf (LOVE them too) then placed old clay pots with WONDERFUL PATINA upon the shelf..how can it get any better? EAT IT UP!! 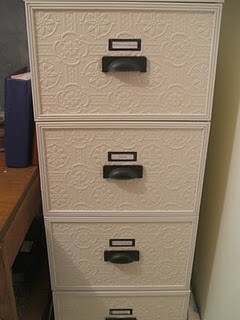 What an adorable way to dress up an ugly file cabinet! 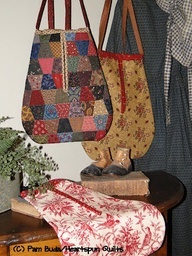 Wouldn't it be wonderful to have a row of them across one wall in your sewing room? OMG... you could have files for your patterns, books, design ideas... even store fat quarters and fabric in them. This is wall paper (textured) and they've cut plastic framing and glued to the outside. Covered up the hand pull with old fashioned mustache pull handles. I think it's a super idea! In my "imaginary" RETREAT HOUSE (that I dream of having) this would be an addition to the rooms. These little signs are simply adorable and OH-SO-CUTE!! You could even name the rooms in the hallway that everyone sleeps in... so they know where to find their bed!!! 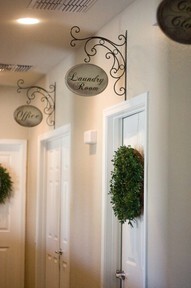 Oh what the heck...this would even be cute in your house... naming the bedrooms, bath, laundry! Love the wreaths on the doors too!!! Refreshing!! Now...this is a MUST in my sewing room! Check out what they did with the old yardstick!! They have hooked it to the rod at both ends!! I'm telling you.. .people are so darn clever! This is a "keeper" idea!!! I adore antique yardsticks - I think it's so much fun to read them and see where they came from.... hardware stores to funeral homes!! 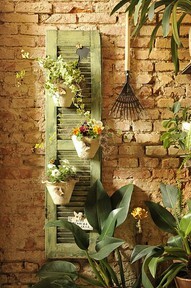 Isn't this pretty... an old shutter with clay pots hanging from it... with small plants. This would be my speed...since my green thumb isn't so much! If I loose a little plant, I can just buy a smaller one and pop it in it's place. Love the textured brick wall it's hanging on...then that little rake just was an adorable touch to the display. Of course...it's my favorite color... GREEN!! How cute is this idea? An OLD, OLD door knob they've attached to there center island. 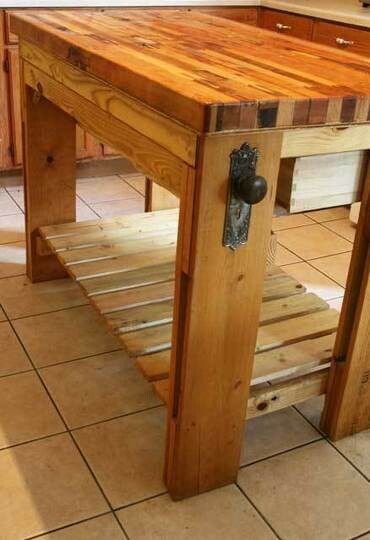 It's used to hang dishtowels on. So much better than a hook...I would be running into that thing on a daily basis... one bruised hip...that's for sure. This idea blew me away... I thought it was so cool. They have taken one of the old paper roller holders and hung it on the wall. Then they've unrolled it and written information on it! Isn't that a cute idea. 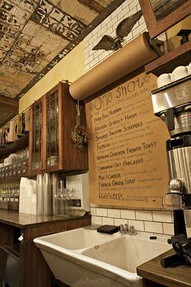 What a fun way to announce menus, specials, sales, etc. to your customers! LOVE IT!!! It's so 'ME' - don't you think? Look what Pam Buda - Heartspun Quilts has just finished. 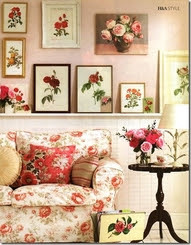 Look at this setting... isn't it beautiful... all decorated with rose prints! Then the flowered couch just is the icing on the cake. The way the wall is divided with the wallboard and soft pink paint is simply stunning. I could sit there and read a book or stitch... couldn't you? This bathroom rocks my world. 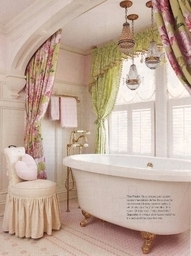 The way they have used the architecture in the room and enhanced the tub area with curtains and hanging fixtures... OH MY... I could be soaking in that tub forever. It's fit for a princess. Now... how sweet is this? Angel wings above the bed. I'd buy these in a heartbeat if I saw them out and about!!! They are just toooooo wonderful!!! 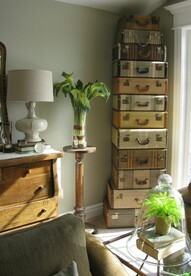 Okay... you know how I feel about old suitcases with this look right? They rock my world (have no clue why...just one of those things...) Look at the stack of them in this house! Way scary... I know those sweet things would come tumbling down on me.... It's safe to say they would need to be secured. WOW.... AWESOME!!! They are almost IMPOSSIBLE to find anymore in antique shops! 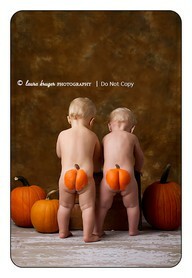 And... look at these cute little fellows... all dressed up for Halloween!!! On this note... it's time for me to get busy! and a fun - fulfilled week ahead of you!